The bark of Cinnamomum burmannii Blume is the main raw material of Cinnamomum oil because its cinnamaldehyde content is higher than in the other parts. This condition lead to the exploitation of Cinnamomum burmannii Blume bark without any cultivation effort, thus it can cause the raw material scarcity. Twigs and leaves of Cinnamomum burmannii Blume are also known to contain cinnamaldehyde therefore it provide a potential alternative source of cinnamaldehyde. The purpose of this research is to investigate the characteristic of Cinnamomum burmannii Blume essential oil which includes refractive index, profiling of chemical constituent and percentage of cinnamaldehyde as a marker compound. This research used three fresh Cinnamomum burmannii Blume simplicia of bark, twigs and leaves from two selected growing locations: Tawangmangu and Purwokerto. Simple water distillation method was conducted, together with characterization and refractive index using refractometer, followed by qualitative and quantitative analysis with Thin Layer Chromatography (TLC) and Gas Chromatography (GC). The results showed Cinnamomum burmannii Blume oil derived from bark, twig and leaf have different profiles, but all have cinnamaldehyde as the main component. The leaf produces higher essential oil yield percentage compared to the twig with a cinnamaldehyde content that is comparable to the bark by 50% of cinnamaldehyde content in cinnamomum bark oil. 1. Inggrid M, Djojosubroto H. Destilasi uap minyak atsiri dari kulit dan daun kayu manis (Cinnamomum burmannii). Jurnal Universitas Katholik Parahyangan. 2008;1:1–16. 2. Izyani FA, Susanti D, Taher M. Antimicrobial activity and synergic effect of Cinnamomum burmannii’s essential oil & its isolated compound (cinnamaldehyde). In: International Conference on Chemical, Agricultural and Medical Sciences. Kuala Lumpur: International Institute of Chemical, Biological, and Environmental Engineering; 2013. p. 26–9. 3. Abdelwahab SI, Mariod AA, Taha MME, Zaman FQ, Abdelmageed AHA, Khamis S, et al. Chemical composition and antioxidant properties of the essential oil of Cinnamomum altissimum Kosterm. (Lauraceae). Arabian Journal of Chemistry. King Saud University; 2014. 4. Badan Pengawas Obat dan Makanan RI. Manfaat yang berguna dari kayu manis. Naturakos. 2009;4(11):10–1. 6. Deng X, Liao Q, Xu X, Yao M, Zhou Y, Lin M, et al. Analysis of essential oils from cassia bark and cassia twig samples by GC-MS combined with multivariate data analysis. Food Analytical Methods. 2014;7(9):1840–7. 7. Rao PV, Gan SH. Cinnamon : A multifaceted medicinal plant. Eveidence-Based Complementary and Alternative Medicine. Hindawi Publishing Corporation; 2014;2014:1–12. 8. Al-Dhubiab BE. Pharmaceutical applications and phytochemical profile of Cinnamomum burmannii. Pharmacognosy Reviews. 2012;6(12):125–31. 9. Haddi K, Oliveira E, Faroni LR. Cinnamon Oil. In: Nollet LML, Rathore HS, editors. Green pesticides handbook : Essential oils for pest control. CRC Press; 2017. p. 117–50. 10. Paranagama P, Wimalasena S, Jayatilake G, Jayawardena A, Senanayake U, Mubarak A. A comparison of essential oil constituents of bark, leaf, root and fruit of cinnamon (Cinnamomum zeylanicum Blum) grown in Sri Lanka. Journal of National Science Foundation Sri Lanka. 2002;29(3&4):147–53. 11. Geng S, Cui Z, Huang X, Chen Y, Xu D, Xiong P. Variations in essential oil yield and composition during Cinnamomum cassia bark growth. Industrial Crops and Products. 2011;33:248–52. 12. Khasanah LU, Anandhito BK, Uyun Q, Utami R, Manuhara GJ. Optimasi proses ekstraksi dan karakterisasi oleoresin daun kayu manis (Cinnamomum burmanii) dua tahap. 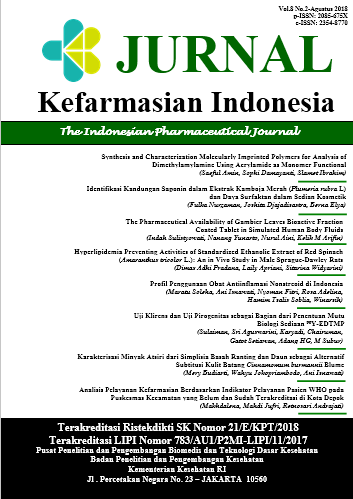 Indonesian Journal of Essential Oil. 2017;2(1):20–8. 13. Lin L-T, Wu S-J, Lin C-C. The anticancer properties and apoptosis-inducing mechanisms of cinnamaldehyde and the herbal prescription Huang-Lian-Jie-Du-Tang (Huáng Lián Jiě Dú Tang) in human hepatoma cells. Journal of Traditional and Complementary Medicine. Elsevier Masson SAS; 2013;3(4):227–33. 15. Widiyanto A, Siarudin M. Karakteristik daun dan rendemen minyak atsiri lima jenis tumbuhan kayu putih. Jurnal Penelitian Hasil Hutan. 2013;31(4):235–41. 16. Singh P, Bajpai M, Prakash O, Tiwari R, Mathur S, Singh RM, et al. High performance thin layer chromatographic method for the determination of cinnamaldehyde in Cinnamomum zeylanicum Bark powder. Journal of Natural Remedies. 2008;8(2):179–82. 18. Wulandari YW, Mustofa A. Pengaruh perlakuan penggilingan terhadap rendemen atsiri daun jeruk purut (Citrus hystrix DC) dengan metode destilasi air. JOGLO. 2017;29(1):1–9. 19. Salgueiro L, Martins AP, Correia H. Raw materials: the importance of quality and safety. A review. Flavour and Fragrance Journal. 2010;25:253–71. 20. Gopu C, Aher S, Mehta H, Paradkar A, Mahadik K. Simultaneous determination of cinnamaldehyde, eugenol and piperine by HPTLC densitometric method. Phytochemical Analysis. 2008;19(2):116–21. 21. Ulfah D, Karsa LA. Pengaruh tempat tumbuh dan lama penyulingan terhadap rendemen minyak atsiri rambu atap (Baeckea frustescens L) dengan penyulingan metode perebusan. Jurnal Hutan Tropis Borneo. 2007;08(21):84–8. 22. Ravindran P, Nirmal-Babu K, Shylaja M. Cinnamon and cassia : The genus Cinnamomum. Taylor & Francis e-Library; 2005. 60-71 p.
23. Gonçalves R de A, Pinheiro AB, de Oliveira MA, do Nascimento RT, Rosalem PF, Garcia VL, et al. Anatomical characters and chemical profile of leaves of three species in Lauraceae family. Brazilian Journal of Pharmacognosy. 2018;28:1–8. 24. Geng S, Cui Z, Shu B, Zhao S, Yu X, Geng S, et al. Histochemistry and cell wall specialization of oil cells related to the essential oil accumulation in the bark of Cinnamomum cassia Presl. (Lauraceae). Plant Production Science. 2012;15(1):1–9. 25. Rehman R, Hanif MA, Mushtaq Z, Mochona B, Qi X. Biosynthetic factories of essential oils : The aromatic plants. Natural Product Chemistry & Research. 2016;4(4):1–11. 26. Nugraheni KS, Khasanah LU, Utami R, Anandito BK. Pengaruh perlakuan pendahuluan dan variasi metode destilasi terhadap karakteristik mutu minyak atsiri daun kayumanis (C. burmannii). Jurnal Teknologi Hasil Pertanian. 2016;9(2):51–64. 27. Wu X, He J, Xu H, Bi K, Li Q. Quality assessment of cinnamomi ramulus by the simultaneous analysis of multiple active components using High Performance Thin Layer Chromatography and High Performance Liquid Chromatography. Journal of Separation Science. 2014;37(18):2490–8. 28. Yuliarto FT, Khasanah LU, Anandito RBK. Pengaruh ukuran bahan dan metode destilasi (destilasi air dan destilasi uap-air) terhadap kualitas minyak atsiri kulit kayu manis (Cinnamomum burmannii). Jurnal Teknosains Pangan. 2012;1(1):12–23.